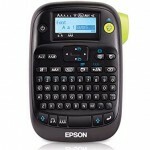 Lately I have felt like our kids and our home have a bit of a technology problem. This year, our two older boys each acquired a small netbook as part of their school's technology program. Our oldest also has his phone and our younger two an iPad. 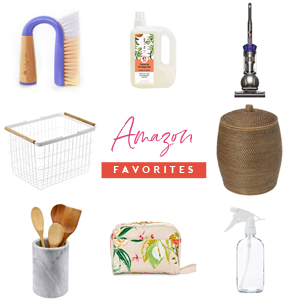 It is a bit ridiculous, and up until recently, all of the different items would pile up on our kitchen counter with a plethora of cords dangling and being tripped on. I know this is an eye roll of a problem, but at the same time, all of that counter clutter does become obnoxious on a daily basis. But lucky for us, when we updated our kitchen, I had a small plan in my mind for this problem. I was hoping to eventually create a cabinet to conceal all of our charging electronics on a daily basis, in a location that was still easily accessible by everyone. While installing some cabinets in our dining area, we had an outlet added by our electrician to accommodate this little dream I had. But of course, it took us until now to finally finish this up. The IKEA cabinets that we installed in our dining area are about 11 1/2" deep, so when it came time to finally decide how to set things up, I started running into a few obstacles. 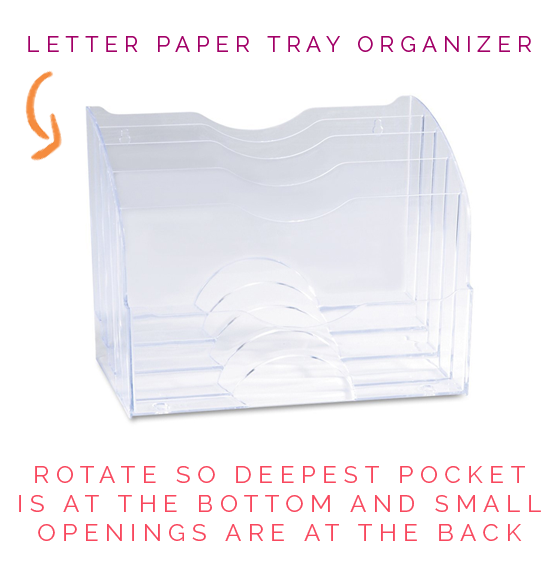 I ultimately found a tiered office organizer, which is generally designed for paper sorting, that had just enough slots and the right dimensions for the cabinet. 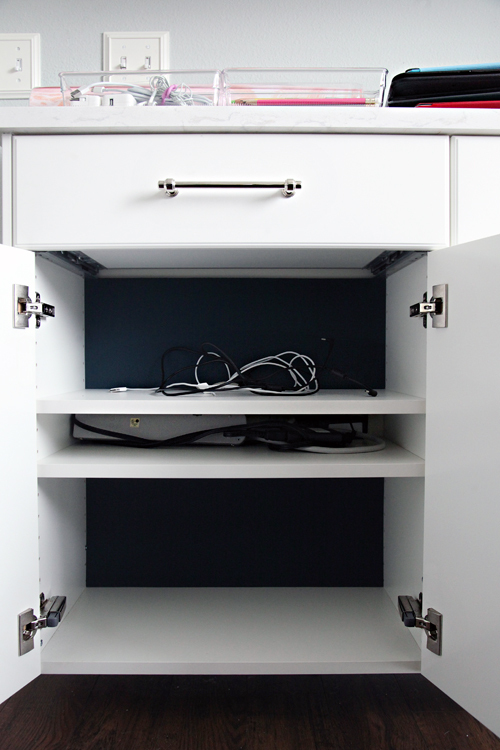 Once we finally started placing everything in the cabinet, the power strip and the organizer didn't fit the way I had hoped, so we ended up creating a small shelving pocket to hold the strip and all of the bulky plug-in portions of the cords. We then fed the cords up behind the shelf, there was just enough space between the shelf and the backing that we didn't have to modify the actually shelving at all. As you can see in the photo above, I painted more foam core board the same lovely navy color I did in our recent coffee cabinet project (Ralph Lauren's Iron Blue). Prior to adding the electronics to the actual organizer, I whipped out my trusted label maker (paired with the clear tape and gold font of course), and created some labels for each slot. 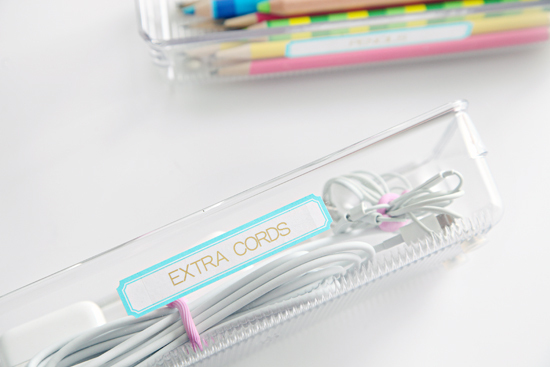 From there, we just fed the cords into each slot through the back of the organizer, leaving enough slack that the electronic item could be pulled out and plugged in/unplugged without any trouble (the excess cord just rests on top of the item while charging). 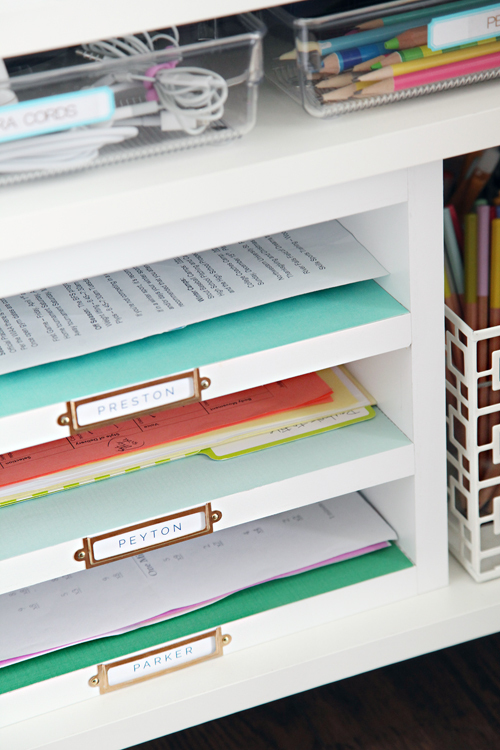 It is not the most beautiful organizer in the world, but it works so incredibly well for us and is so simple for all three of the boys to use. So this is now our new central command station area. It works so well being right next to our table where the younger boys work on their homework each evening. After we lost our wall pockets from our previous kitchen setup, we needed a new homework paper sorting system. I also wanted to add a few more bulkier school project supplies and a little stationery kit for myself. But first, I wanted to disguise that power strip section, so I hunted down two drawer organizers I had on hand and used them to hold a few extra cords for when we want to charge our phones near the sofa and some extra headphones. 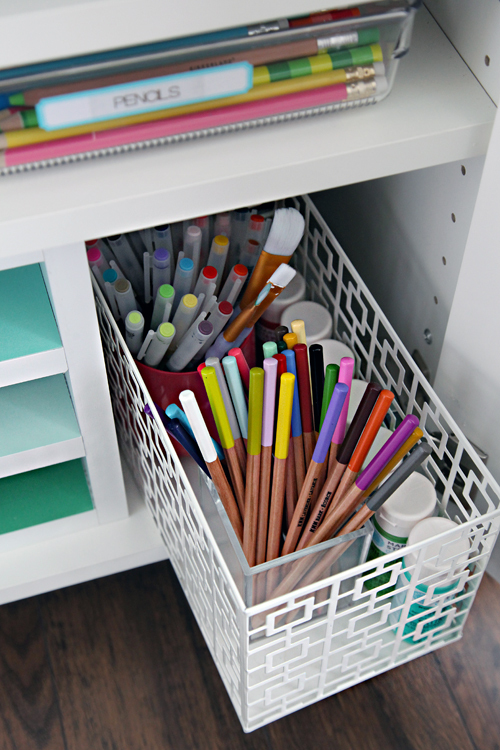 I also added a second pencil location because the school supply drawer has became over run with extra household pens and no one can ever seem to hunt down pencils at homework time. To label the organizers, I used some blank Martha Stewart Avery labels paired with more label maker tape. It turned out to be a lovely combo! I had already exhausted my budget for the cabinet on the charging slots, so I couldn't stand to double it on paper sorters. 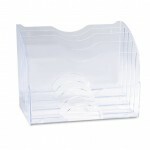 Why are nice, wide, stackable paper trays so expensive? Lucky for me I have a handy hubby that dug through our garage of scrap wood and found just enough melamine boards to piece something together for me, free of charge. I just added some scrapbook paper to the bottom of each slot, paired with a label holder and now each boy has a location to store their daily school reminders and papers. Thank you Mr. Jones! 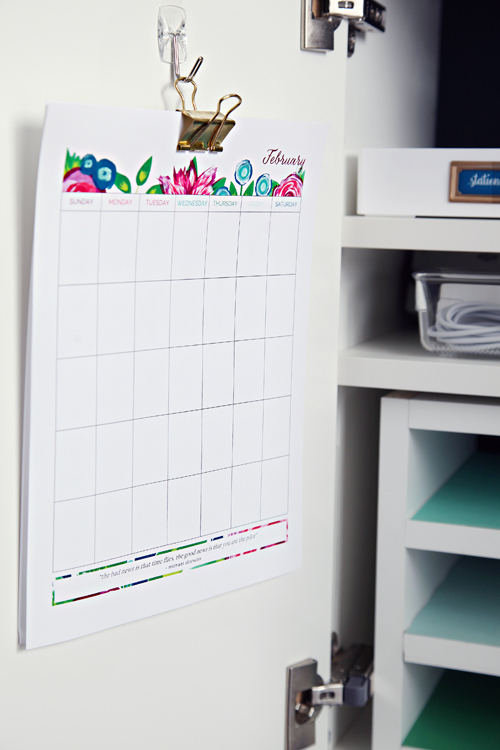 To keep track of assignment due dates and sporting schedules, I printed off one of my free calendar pages (shared here) and clipped it to the inside of the door with a binder clip hanging on a Command Hook. 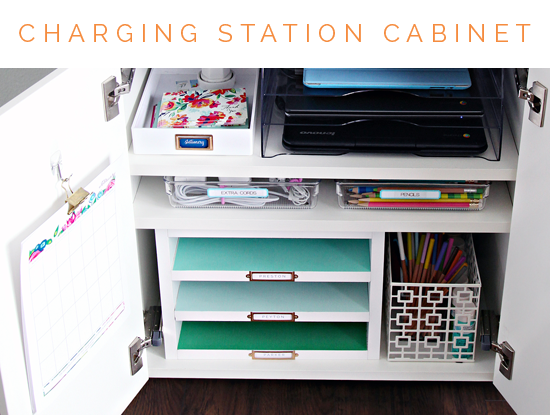 And this cute little school/charging station is where it is at for the whole family! 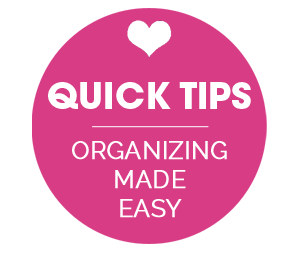 If you have been reading for awhile, you know I have tried just about every method for organizing incoming school work, and nothing works better than a single slot that is really easy to get at. 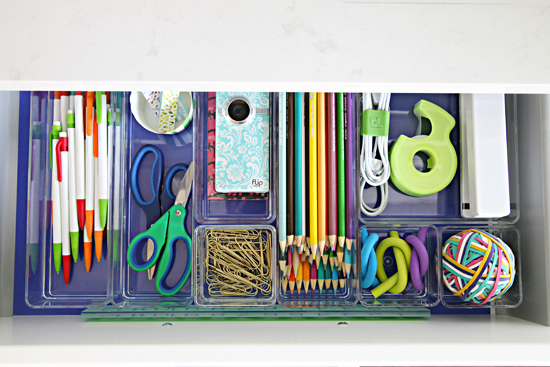 The study boxes worked great for school supplies at homework time, but papers never stayed in that box and ended up in piles on our counter over time. 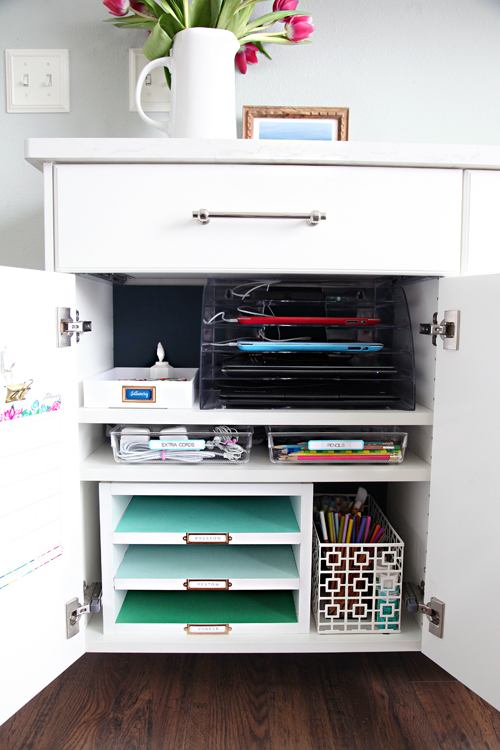 I am thrilled to finally have a good solution in our new kitchen setup, that is allowing the kids to stay easily organized. Because I usually receive quite a few product source questions, below are a few of the items we used to make the most of this cabinet (similar items selected in case I couldn't find our exact piece). Of all of the cabinets I have organized in the kitchen, this one has benefited us more than any other. No more gadget counter clutter and easy systems for our boys to maintain is a double win here. Love this! 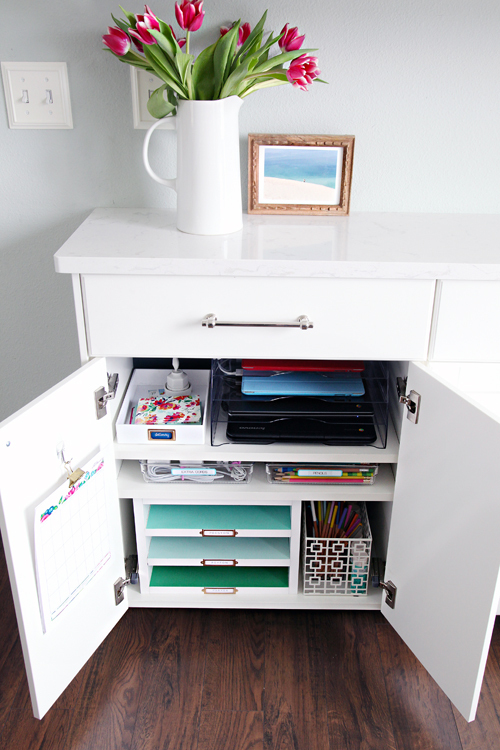 I just ordered a new piece of ikea furniture for our entry hall to try and control my husband's papers and junk he always leaves at the front door (of course, I never do that.) 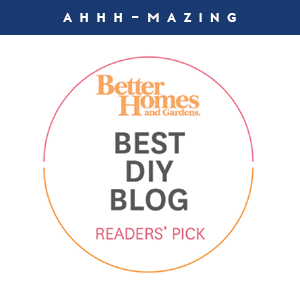 This post is timely and I think I'll have an electric outlet added too. thanks!! OMG Jen!!! I love this cabinet so much. The fact that your cabinet is basically bookcase depth means it would be easily replicated in so many ways. I've been struggling with electronic charging station setups and this one seems perfect. I hear you on the "accidental" slip up where the device ends up in their bedroom even though they "thought" they had put it in its proper place. It's rare that happens outside of a weekend for my son but my daughter used to do it all the time when she was that age. Hope you had a wonderful visit with Cassie and didn't get too spoiled by the non-Wisconsin weather! I'm trying not to complain since my Kenosha winter has been pretty nice this year. 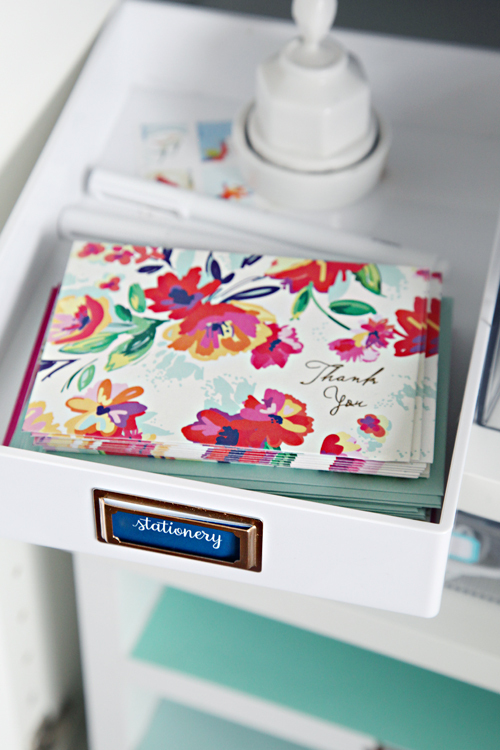 How do you track down those Martha Stewart labels/ brackets??! I think they have been discontinued, right? Or have you found any suitable replacements? I can think of about 15 projects we could use those for! Love this idea and it looks great, but having an outlet in an enclosed cabinet is against electrical code here, is that allowed where you live? I might try to do an open version of this under my built in office desk. It is definitely important to check with both a licensed electrician and local codes. We are allowed to utilize outlets inside of cabinets, we also used one for our microwave in our pantry and many homes even have them installed inside of drawers. They need to meet specific requirements, which our electrician handled on our behalf. It looks great!! Such a great idea! I absolutely love this! Love the names on each shelf, it looks great! 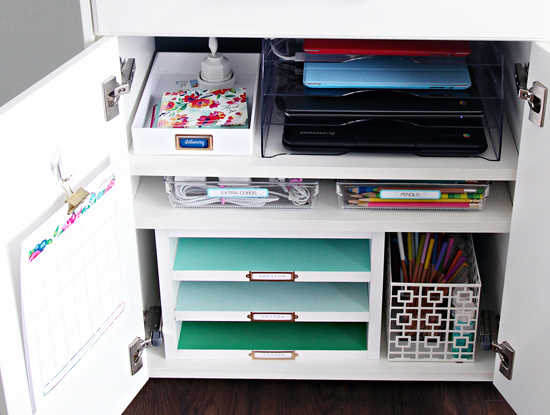 I recently stumbled upon an organizing solution that was right in front of me for so long. We had a tall/narrow cabinet in our kitchen which I was only using 2 of the shelves and paper clutter just never was maintain on the counters, and it hit me....containers for all 5 us! 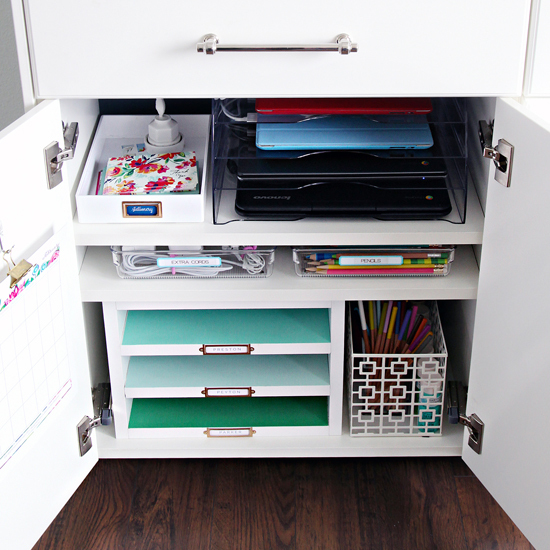 I used the $4 12 inch wide sterilite containers, labeled for each family member and even my 3 year old puts his school papers in his "cubby"
That is so great, I just love when that happens! 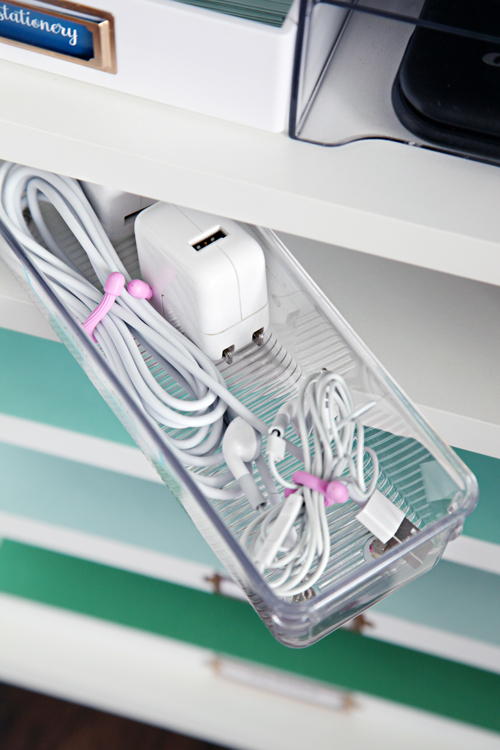 <3 Those Sterilite bins are perfect for so many things! Where are the coloring pencils on. The bottom right from? What an awesome idea! I will have to try that charging station soon! 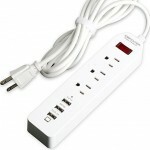 Did you have an outlet installed into the back of the cabinet? Where did you purchase the light pink cable ties? Thank you! I linked the cable ties at the end of the post. :) xo! 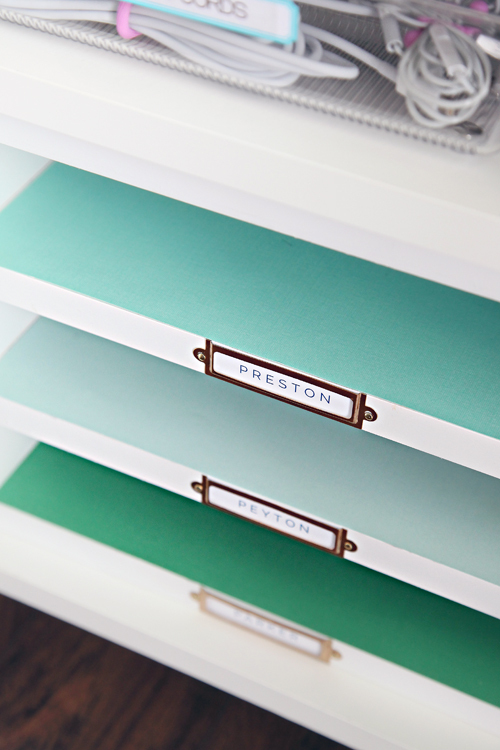 I would love to have some instructions on how you built the paper sorter for your boys! I have been looking for something with 3 like that! Sounds good! I will pull some together and post it this week! :) xo! Love this just like I love everything you do! 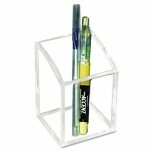 I am curious about where you store your organization items when you are not using them. You know, extra items that you don't want to throw away in case you need them. Oh my gosh!!!! I absolutely LOVE this!!! 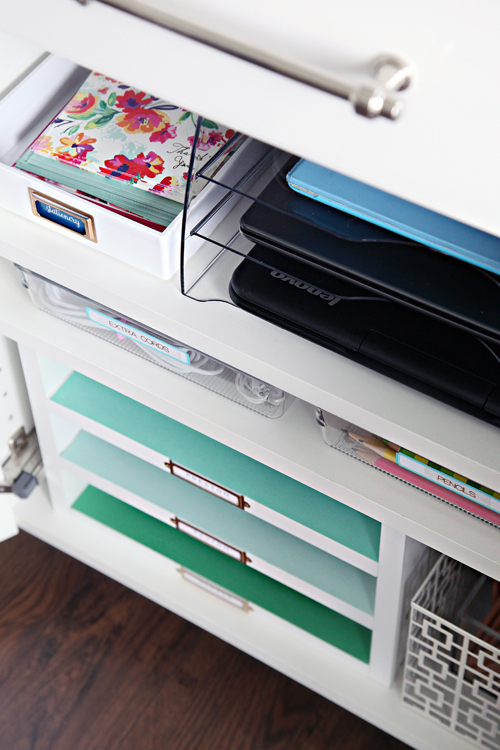 So organised, tidy and useful. Absolutely fantastic. So annoying to find a laptop charger plugged in and led on the floor . . with no laptop attached! Watch out family! I love this! I have a new ikea cabinet that would work wonders for this! Please, tell us more about your letter writing! I constantly have a list in my head of people who I need to write a letter to, but I forget to do it right away then forget who I was supposed to write a letter to to begin with. What tips do you have? I try and take a few minutes to write when the mood strikes, or to jot a reminder in my planner if I don't have time/access to my stationery when my thoughts hit. I also clip cards in my planner around specific important dates. 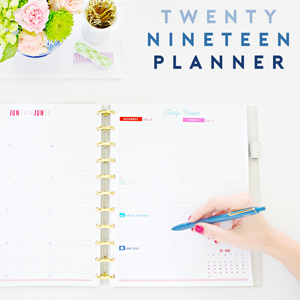 I find that if I keep small stacks of stationery in a few different areas of our home (my planner, my desk, in the kitchen and in my nightstand), I am much more likely to write. You are so cool, Jen! love it! Wow! This whole cabinet is awesome. I think I will have a charging station in my future. This is a great idea. 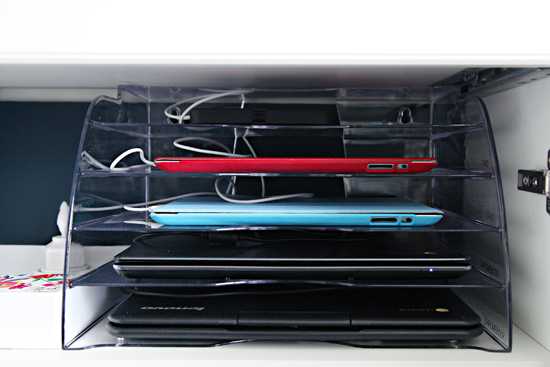 My husband and I have cords and gadgets all over the place. I'm surprised one of us hasn't hurt ourselves climbing over the cords! Who know cord clutter would be such an issue in a wireless world!? Have you been spying my Google searches because I have been looking for solutions and ideas for this exact problem. I'm definitely using your expertise and you have my same sense of function and design in mind. 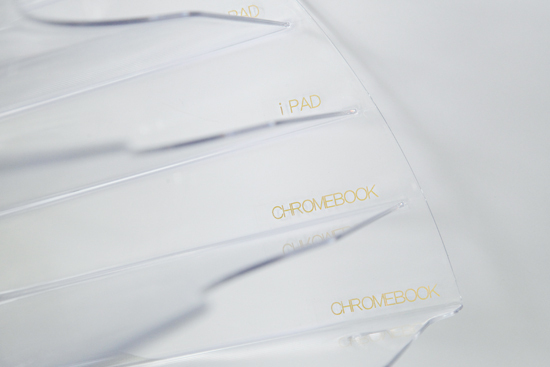 Must be useful, but also nice to look at. THANK YOU!!! I LOVE this!! I seriously want to go home and recreate all of this right now. The best part is the stationary area. This year I have wanted to focus on sending out personal letters, but am always searching for my stamps, cute paper, etc. Now no excuse!! I'm in love with this idea!!!! I do have a question,are you still using the school cubby you had set up for them before? We still have them but we will be phasing them out eventually as we look to relocate the storage of their daily gear. Can't wait to see updates, you always inspire me and give me ideas on how to organize my home which I need a lot of help with 6 kids and not a lot of room to play with, thank you!!! 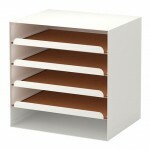 Hi, could you share which ikea cabinet you used? Thanks! They are 24" wide cabinets that are intended to be upper cabinets, but we needed something narrow so we installed them low. They are part of IKEA's cabinet line that expired last year, and I am not sure that their new line offers the same cabinet/components. Hello! I was linked here by Maneuvering the Middle, and found many of your posts to be wonderfully useful! 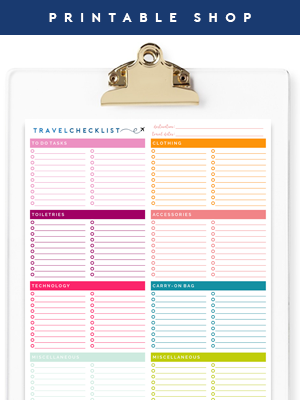 Thanks for the free printables and tips on organization!